Credit where credit is due, this isn’t the first technology job advertisement to feature an “encoded” message, but it’s still nice to see Microsoft UK (note the pound) experimenting with it too. However personally I think it’s way too easy, especially for a challenging employer like Microsoft. (found via The Chip Shop Awards 2009). Update: It turns out the Chip Shop Awards is a light-hearted advertising competition that accepts entries which may not be for actual clients or have been published in public. It’s impossible to tell if Microsoft UK officially sanctioned this particular creative, although they probably should. In the same competition is another “faux” creative worth mentioning for XBOX 360 that makes reference to the 13 year old kid who claimed to the be a father. 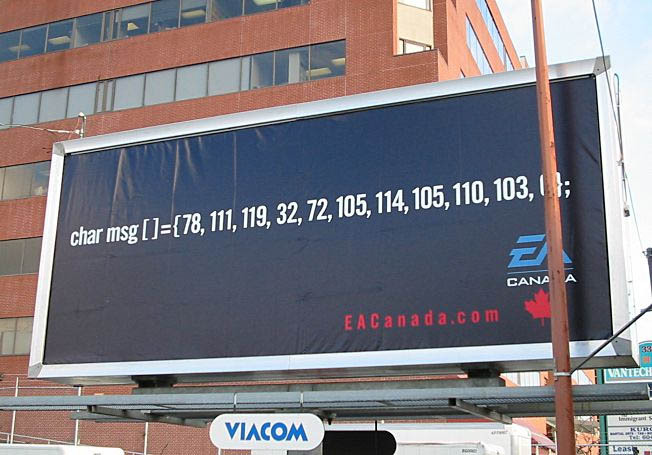 It’s still a rather clever ad. Cool! Thanks for pointing that out to us. Did you do a Google vs Bing search of the equation? That was actually really easy – I think I actually solved it. Heh, I know creative spark.. I also used to do the chipshop awards website years ago.. anyway the artwork is generally from pitches that were rejected.. some of them are really good, I think theres probably a lot of entries that weren’t actually pitched.. just made for a laugh for the website. But yea, the idea is copied, the design is clean however ;). 01 876 8000 is not a valid UK phoen number! This seeems to be a viral for Creative Spark. It certainly was not used by Microsoft UK and the equation solves to a phone number which is not dialable in the UK.